The Bruins played the Penguins on Saturday and for once, Sidney Crosby was the least of the Bruins problems. The game was nothing special. The Bruins once again blew a lead and were losing two to one with about five minutes. It was at this point that the Bruins may have changed and changed for the worse. Marc Savard had just released a shot when he received one to his head. 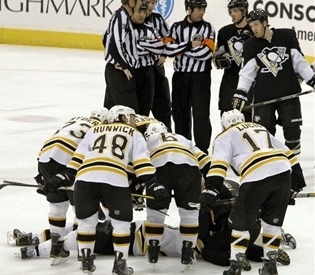 Pens defenseman Matt Cooke took a run at Savard’s head and left Savard motionless on the ice. For Bruins fans, we know this scene all too well with what happened to Patrice Bergeron. Right off the bat you could tell that the hit was directly to Savard’s head and that it looked clearly to be Cooke’s elbow that made contact with Savard’s head. Call me bias because I am a Bruin fan and think it was a dirty hit but how can you think it was a clean hit? And if it is legal because of the current rules in the NHL then those rules need to be changed. I know hockey is a dangerous sport and accidents happens but it is only an accident if it legal. Cooke knew what he was doing and he knew it was illegal like Bergeron said after the game how would Cooke like to be the other player in that situation? I’m sure he would prefer not to be. Dirty hits and suspensions aren’t anything new to Cooke. He was suspended in November for two games. However, he will not face any punishment from the NHL but hopefully the Bruins will dish out their own punishment later. Just because the League thinks the hit was clean why would a player still make that hit? There is only one outcome of an elbow to the head and that is a concussion. Why would make Cooke still make that hit? Clearly, he does not care for the well-being of others. Yes, I know it’s hockey but dirty hits that will result in injury have no place in hockey. Start a fight if you want to injure someone. There you have to willing combatants who know the consequences. With all that said, there is still more to talk about than just the dirty hit. I know referees can sometimes miss calls like hooking or two many men on the ice but how to you miss something like that hit? Savard had just released the puck and therefore all eyes should have been on him when the hit happened and yet nothing. There was no call, not even for elbowing! In the aftermath, Cooke not getting a suspension seems wrong but at the moment it happened, he not getting a penalty was completely wrong. That needs to be a play where the review officials can step in and make a call from upstairs since the officials on the ice supposedly missed it. Mistakes happen, I know, but video replay does not lie. And there is one more thing that makes me angry about this game and surprisingly it has nothing to do with Crosby. It has to do with the lack of emotion from the Bruins. The Bruins did nothing after the hit occurred and Savard lay motionless on the ice. I understand that they wanted to try and win it for Savvy and they did have a few chances but going after Cooke (legally of course) would have be a little better. True the Bruins need wins right now as they are hanging onto a playoff spot but a little emotion was warranted in that situation. Michael Ryder who was right behind Savard when he was hit did not even chase Cooke right after he delivered the hit. This is another area where this year’s team is different from last year’s team. The Bruins are scoring less and physically competing less. And if the Bruins had won the game against the Pens, I would be telling a different but they didn’t win and they didn’t stick up for their most potent offensive player. So what can this team accomplish without Marc Savard? The team may be less potent offensively without number 91 but that does not mean that they can’t still compete and make it to the playoffs. The Bruins are still a solid team with Bergeron and Krejci down the middle to fill the void left by Savard. Veterans like Recchi and Satan will also need to step up like they have in the past to show that this is something the team can overcome. Similarly, youngsters like Sobotka and Marchand, who will likely take Savard’s spot on the roster for the rest of the season, will need to contribute in big ways to help the Bruins. One thing that is making the loss of Savard a little bit easier is that the Dennis Seidenberg is much better than Derek Morris. With this upgrade, the Bruins are stronger on defense and when you don’t have offense, your defense is your best offense. With the addition of Seidenberg and both goalies playing well, the Bruins still have the potential to make a run at the playoffs even without Savard. Let’s hope Marc Savard has a speedy recovery and that someone sends a legal message to Matt Cooke when the Bruins play the Penguins next Thursday. If the Bruins don’t, I am pretty confident that the Garden faithful with serenade Cooke with boos whenever he has the puck.